Will Kim Junsu’s ticket power strike again? The first round of ticket reservations for ‘December: The Song That Hasn’t Ended’, the musical to commemorate the 50th anniversary of Kim Kwang Seok’s birth, will be opened on the 1st of November. The musical ‘December’ will begin on the 16th of December, the first musical to start on a Monday, and plans to break records in the industry. A total of 30 performances will be held in the 3,000-seat theater of the Sejong Culture Centre and ticket reservations for all 90,000 seats will be opened simultaneously. ‘Ji Wook’, the leading role of an unforgettable 20-year-old love story, will be played by Park Gun Hyung and Kim Junsu, and the musical has already been chosen as the most anticipated production of the second half of 2013. ‘December’ will combine Kim Kwang Seok’s magic, which has already brought success for the musical ‘Those Days’, and Kim Junsu, who boasts the greatest ticket power in the musical industry, to create the greatest musical of the year. Kim Junsu made his musical debut in 2010 with ‘Mozart!’ and sold out all 15 performances of 3,000 seats. He has also sold out his performances of ‘Tears of Heaven’, ‘Mozart!’ and ‘Elisabeth’ in 2012. ‘December’ is set to continue this legacy. 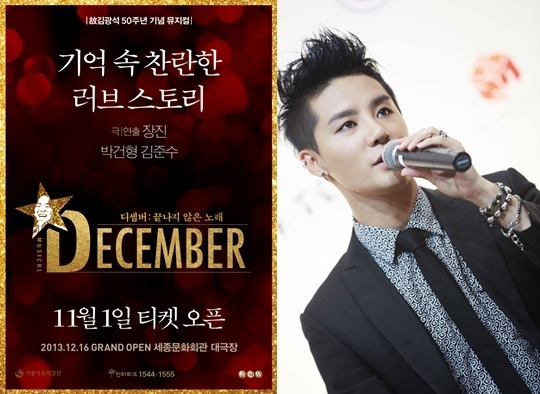 Meanwhile, the musical ‘December’ is set to make its mark as it brings together Park Gun Hyung, Kim Junsu and Director Jang Jin. The musical will open its curtains on the 16th of December.